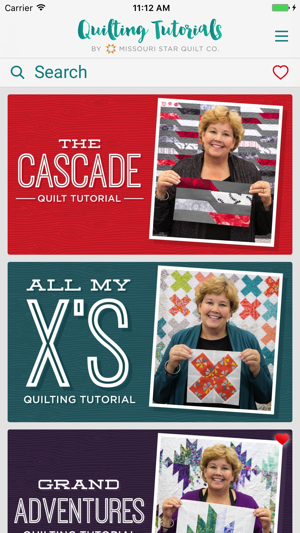 Free quilting tutorial videos from Jenny Doan of the Missouri Star Quilt Company! We have hundreds of quilt patterns to choose from for beginners and experts alike. You’ll love learning to sew with us! We add new tutorials all the time! 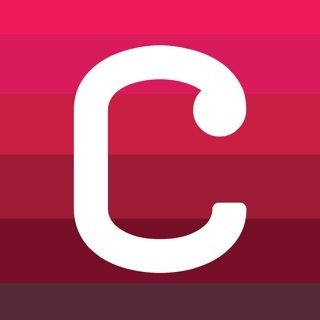 Download the app for free now! Shop the world's largest selection of precut fabrics at low prices! We offer Daily Deals at 30%-100% off! 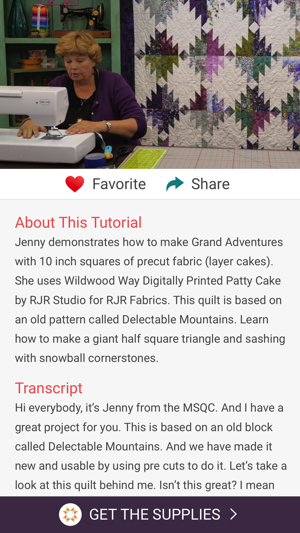 Once you’ve gotten the app, head over to Missouri Star Quilt Company's website to get your supplies and get sewing! 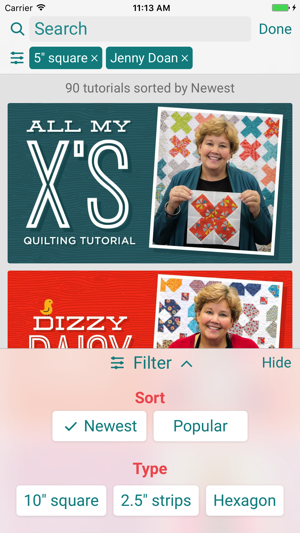 We've updated our app with fixes to make things even better for our quilters! I love your stores. My daughter and I made a weekend of visiting Hamilton MO. We drove up Friday and spent the night at a very nice B&B just a few miles away. Saturday morning we drove into Hamilton. We only expected to be there a couple of hours at most. We spent the entire day shopping and looking. Everyone was very nice and so helpful. Thank goodness we got to town early and was able to park close. We made at least 2 trips to the car to unload our packages then back to shopping and looking. I must admit we did more shopping than looking! The Missouri Star Quilt Company is a wonderful company. I use the tutorials. Thank you Jenny! I purchase fabric and quilt notions from the web site. Shipping is very reasonable at $5.00 flat rate and orders are sent quickly. Usually within a couple of days I receive my order. I would encourage everyone to visit the Missouri Star Quilt Company for a day of pure heaven! You can get lots of very cool patterns and they are all free. Not only free but you get a free tutorial showing you step by step how to make the quilt top. While many of them look very complicated they all have simple tricks that Jenny teaches you that make them very simple to complete. The way they are presented through the app you don’t have to worry about looking at each one and saving everything. They are always right there at your finger tips. You can also mark the ones you really like or want to try to find them more easily later. 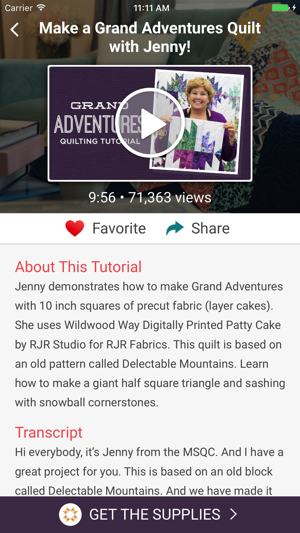 A great way to learn and take a lot of the mystery out of quilting and also a way to have beautiful quilt tops without a ton of intricate work! Jenny really makes it easy and fun and she’s a hoot to watch and learn from. A lady who is very talented but doesn’t take herself to serious and likes to have fun. Definitely download the app. I recently was traveling out of FL to avoid hurricane Irma and stopped at a visitors center to take a short, badly needed driving break. While there, I decided to glance thru a MO travel guide and came across a nicely written article about Herman Missouri and MO Star Quilting Co. Although I have never had the pleasure of actually visiting this quaint fabric store, I felt a surge of pride fill me , as I recalled the many, many quilts I have made with the beautiful fabrics I have purchased on-line from this fabulous fabric store and the countless numbers of tutorials I watched over the years. As I got back in my car, I had to smirk at the fact that I was traveling with my sewing machine in tow and was excited to get back home to finish the quilt I started making while on vacation in FL with the beautiful fabric I had once again purchased from MO Star Quilting CO.